This week sees the Tory conference held in Manchester. Various ministers have already spoken but today we will hear from a man, Iain Duncan Smith, who for many carers is the biggest failure to date. Past, and present governments, have continuously ignored the plight of carers, a group of people that give so much. Their Love, and the care they provide, taken for granted by those in power. 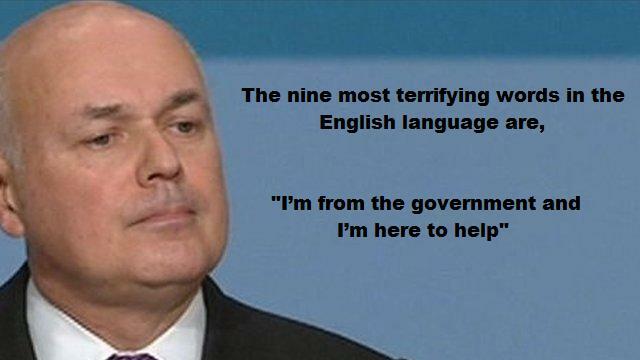 So why has Iain Duncan Smith failed miserably? We are in the middle of the biggest shake up to the welfare system for over 60 years, changes that see many benefits changed/cut, support withdrawn, and yet the issues surrounding the LOWEST benefit of all were not addressed. Carers Allowance is just £59.75 and care must be provided to a minimum of 35 hours . Family carers are undervalued in our society and receive a disproportionately low level of financial support given the many hours of work that they do. Mr Smith has missed a golden opportunity to reform this benefit. This entry was posted on 1 October 2013 at 10:45 and is filed under Carers. You can follow any responses to this entry through the RSS 2.0 feed. You can leave a response, or trackback from your own site. Exactly four years I’ve been a carer now and struggled on this pitiful amount.They may treat me as a second-class citizen but they will never take away my pride & dignity. It is surely a joke to expect a politico to do anything other than feather his nest??? Carers have only ONE weapon. Unless many elect to use it , NOTHING will change. I have been caring for over 30 years, and my pride and dignity were taken away a long time ago. As both carer and caree, all our benefits will be replaced by others or stopped (except the derisory CA of course). The utter intrusion, the indignity of having to prove the presence of conditions we have lived with for decades will prove too much for our fragile mental health. I am not expecting either of us to survive. I am planning for life to end in the next few years. I am abandoning my interests and projects, as there is no point to them. We are not making profit for rich people, and they do not want us cluttering up their diminished welfare system. I concede defeat. They have won, and the world has become the most miserable of places. Time to go. @admin Please contact Dan. He appears at his wits end.